The words "The Joy of the Lord is our Strength" were spoken by Nehemiah after the rebuilding of Jerusalem possibly 1000 years before the Birth of Christ. He had found himself as a servant in a strange land serving a strange King named Artaxerxes. Nehemiah was of course a captive and as the years passed by his thoughts turned again and again to his people, the Jews and the city of Jerusalem a place where God had put his name. He enquired from some men of Judah about the city and what they told him made him very sad. What he done next is important, he prayed to the Lord God of Heaven and asked for guidance and help. His ambition was to go and restore the city of Jerusalem. It had been plundered and all the walls were broken down, the gates burnt, homes destroyed and the Jews demoralized. He plucked up the courage to ask the King for leave of absence and the King answered with these questions. How long will your journey be and when will you return? Can I pause here and ask my reader to ponder these questions. We are told that three score years and ten (70) is our allotted time, God may grant us more, but then where will I spend eternity, We shall not return because the Bible says it is appointed onto men to die just once. The Bible does not support the idea of re-incarnation. work cease whilst I leave it and come down to you." If we stop here and think of our Savior's words in His High Priestly Prayer in St John's Gospel Ch: 17. "I have finished the Work that thou gavest me to do" a clear reference to His Cross Work on Calvary where he paid the price for our Sin and opened the way back to God to all who will but put there trust in him. 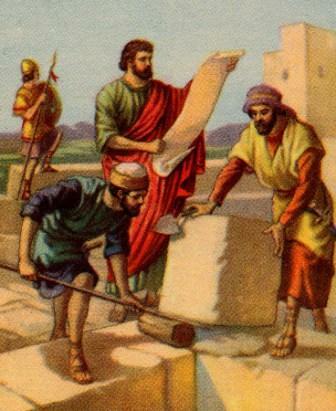 Jerusalem through time was re-built and Ezra gathered the people around with Nehemiah to give God thanks and when he opened the scroll and gave the meaning of the words to the people, they worshiped God and looking back they could say "The Joy of the Lord was our Strength". Reader we too can experience the Joy of the Lord in our daily lives as we build our histories. Jesus said "My Joy I give unto you not as the world give". Let us in the days in which we live put our Faith and trust in that Finished Work which took place on Calvary, and will be forever sufficient for us throughout eternity.